All throughout the Old Testament we find hints about Jesus. Then as the New Testament dawns, the brilliant light of Jesus makes sense of all the hints we had previously seen. A baby who was born at one of Israel’s lowest points was named Ichabod = God’s glory has departed. A baby who was born with quite a lot of hair was named Esau = hairy baby. Esau’s twin brother was hanging on to his heel when he was born, so they named him Jacob = the one who grabs the heel. After a time of upheaval in Israel’s history, God directed the parents to give their son two names: Solomon (which means peace) and Jedidiah (which means beloved by God). This brought reassurance to the parents and to the country. When God was about to bring a quick answer to a problem, He directed the parents to name their son Maher-Shalal-Hash-Baz, which means God will bring the reward sooner than you think. But what is most interesting to me is when God changes someone’s name to reflect the new nature in their life. Abram’s name meant exalted father, but God changed his name to Abraham, which means father of a multitude. His wife’s birth name was Sarai (princess) and it was changed to Sarah (a noble woman). God put His own name into theirs. God’s name means I AM. We sometimes pronounce it Yahweh, but that is only a guess since the Jews wrote His name without the vowels. That means His name was the unpronounceable YHWH, sort of a breath-sound. So Abram became Abrahaaam and Sarah became Saraaaaah. As you follow Abraham and Sarah’s descendants, you will see time and time again God reminding people: You can’t do it on your own. You must have Me in you in order to live the life I have for you! Hoshea was born as an Israelite slave in Egypt, yet his parents gave him this name that means deliverer. Before God could use Hoshea to bring the Israelites into the Promised Land, He first changed his name to Joshua, which means God is the ultimate deliverer. Joshua in the BC Hebrew language is the same as Jesus in the AD Greek language. Jesus Christ is the ultimate example of being able to fully deliver people not just from physical slavery, but from the eternal consequences of sin. Man cannot save himself, but Jesus Christ can. That’s why when you surrender to Christ and allow Him to be your Lord and Master, He puts His name in you: CHRISTian! A new name, and a brand new nature because of what it means to have Christ in you. Jesus had a way of praying that sounds unusual to our ears because He didn’t pray “normal” prayers. His prayers were bold statements! But Jesus also taught us to pray just like He did. In Luke 6 there is a story about a man with a withered hand. Jesus healed him by speaking to the man, not to God. He said, “Stretch out your hand,” and when the man did so, his hand was completely restored. Jesus spoke with the authority of the Creator. I believe this was possible because Jesus had an unbroken conversation with His Father and the Holy Spirit. Certainly He had set times of prayer (see Mark 1:35, Mark 6:45-46, and Luke 6:12-13 as examples), but Jesus also told us that He only did what His Father told Him to do (John 5:19), and He only said what His Father told Him to say (John 12:49). I know sometimes people want to say, “Yeah, but this is Jesus we’re talking about! C’mon, He’s the Son of God, so of course He could do these things.” But remember that the miracle of Christ’s Incarnation is that He chose NOT to do these things out of His Deity while He was on Earth, but restricted Himself only to His humanity. That’s why the Bible says that everything we face, Jesus also faced in the flesh (Hebrews 2:14-18). But perhaps another example from someone who had no Deity in his nature might help. Consider Joshua—this man spent more time in God’s presence, listening to His voice, than even Moses (Exodus 33:11). 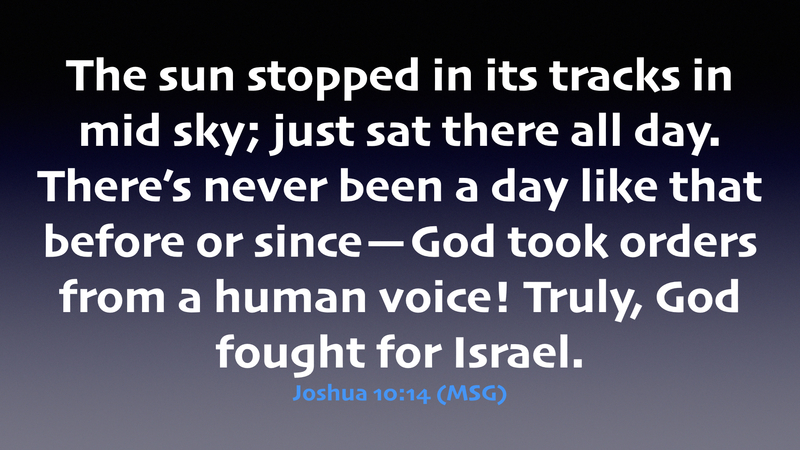 So when the time came, Joshua could pray an incredibly bold prayer: He actually spoke to the sun and the moon and told them to stand still in the sky, AND THEY OBEYED HIM! Just like Jesus spoke to the man with the withered hand in the authority of the Creator, Joshua spoke to the sun and the moon in the same authoritative voice. How could these men do that? Because they were familiar with God’s voice, and when He told them to speak out boldly, they simply obeyed. Jesus said we could pray the same way—Very truly I tell you, whoever believes in Me will do the works I have been doing, and they will do even greater things than these, because I am going to the Father. And I will do whatever you ask in My name, so that the Father may be glorified in the Son. You may ask Me for anything in My name, and I will do it (John 14:12-14, emphasis added). How can we learn to pray this boldly? We need to spend more and more time in dialogue with God. We need to become increasingly aware of the His abiding presence with us. Then we, too, can pray in the Creator’s authority. Praying this way glorifies God! Am I spending time in planned prayer and Bible reading? How can I make myself more aware of God’s perpetual presence? 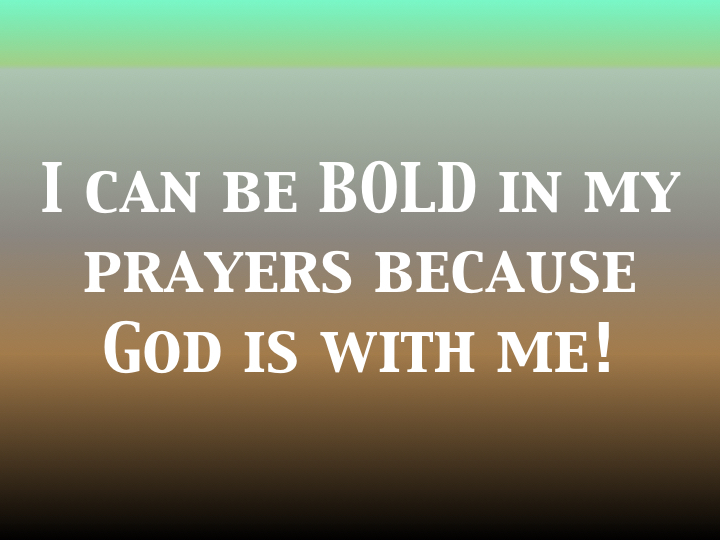 What’s holding me back from praying more boldly? Pastor Phillips Brooks visited Israel in the mid-1800s. While there he visited a small church just outside of Bethlehem. Listening to the worshipful songs being sung in that quiet countryside, he was inspired to pen the words to O Little Town Of Bethlehem. But little does not mean insignificant. And just because we can’t see or hear something doesn’t mean it doesn’t exist or it isn’t important. Sometimes we’ve looked and listened and waited and searched for so long that we have given up and we begin to drift off to sleep. We continue to live in our own “little town” surrounded by silence. And we are in danger of missing a miracle right in our midst! 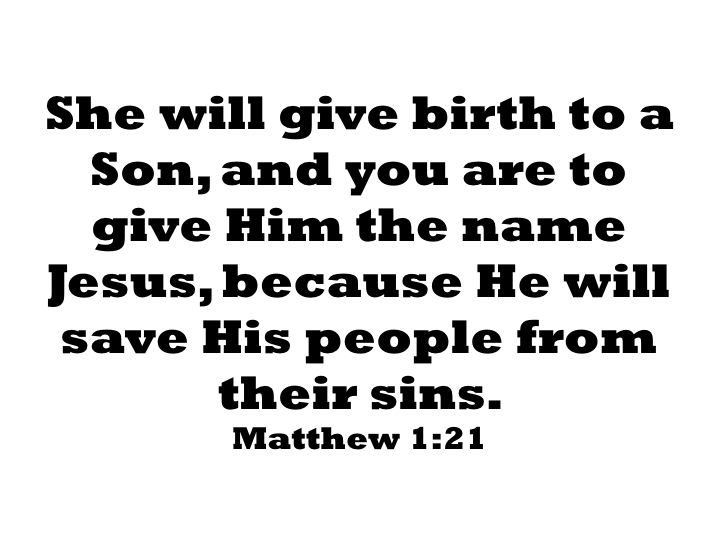 We know today that Jesus was born in Bethlehem. But did you know that this little town was still so obscure in Christ’s day that many people in Israel were unaware of what went on there? (See John 7:41-43). Even after King Herod had gruesomely killed all the baby boys in Bethlehem, scarcely anyone outside of that town knew about it or cared about it. But God cared. And He knew exactly what He was doing. But when the proper time had fully come, God sent His Son (Galatians 4:4)—the exact right moment—to be born in Bethlehem—the exact right place (Micah 5:2). Notice even Micah says of Bethlehem though you are small among the clans of Judah, giving birth to the title of Rev. Brooks’ poem. How small was it? Look at the description of the territory for the tribe of Judah (in Joshua 15), and you can easily glossed over the names of all of the towns. But look more closely and you will see something you didn’t read in that list of towns. Take a close look at all 38 cities: it’s still missing. 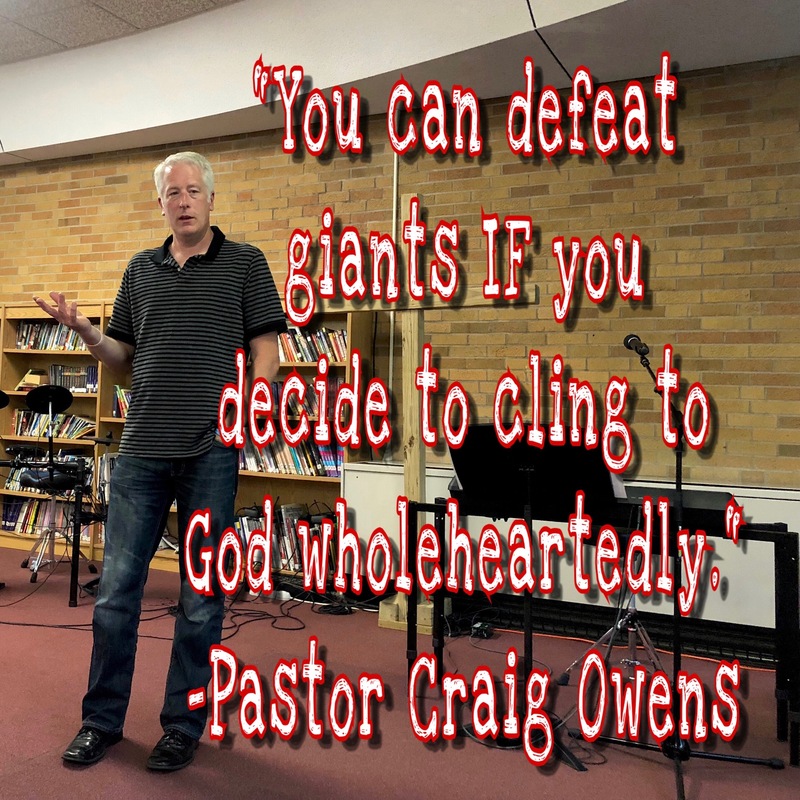 There are a couple of very notable figures that dominate the Old and New Testaments, and they have something in common—King David and Jesus both come from the tribe of Judah. And both of them were born in Bethlehem. But in the list of towns in Judah’s territory, there is absolutely no mention of Bethlehem. This town either didn’t exist, or it was so “insignificant” that Joshua didn’t even think to mention it. It would be almost another 500 years before David would be born in Bethlehem, and then another 900 years after that before Jesus would be born in this little town of Bethlehem. God had in mind for the greatest earthly king in Israel’s history and the King of all kings to come from such humble origins… from a village that didn’t even make the list. Bethlehem was ready for these kings at just the right moment! Jesus said heaven and earth will pass away, but His words will never pass away. 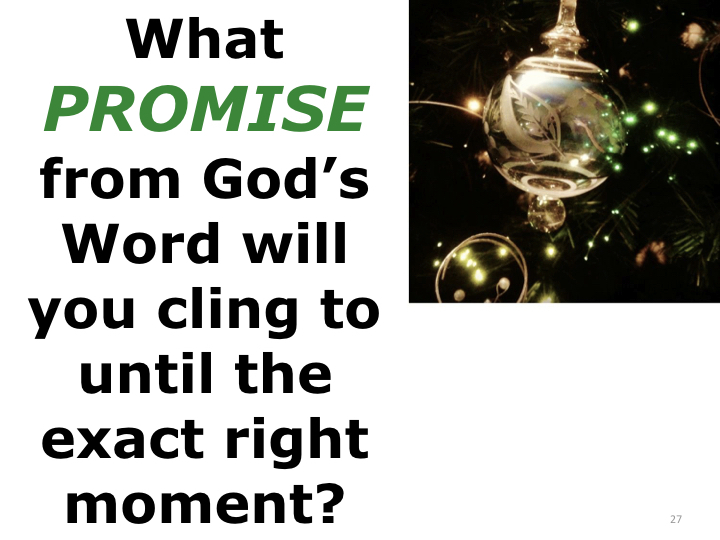 What promise in His Word do you need to cling to? Just as those awaiting the Messiah clung to Micah’s promise until it came to pass, you must find God’s promise for you in His Word, cling to it, and don’t let go until it comes to pass in your little town. I’m convinced that many of us have missed answers to prayer because the answers seemed “too practical” or required “too much work” from us. Consider the well-known example of the defeat of the city of Jericho as recorded in the Bible. That’s it. Not pray, pray, and pray some more. Not go on a 40-day fast. Make no mistake, the Israelites had been in a period of renewed passion and prayer. 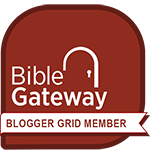 As they entered Canaan, they sought God, renewed their vow to serve Him alone, and celebrated the Passover just days before encountering Jericho. 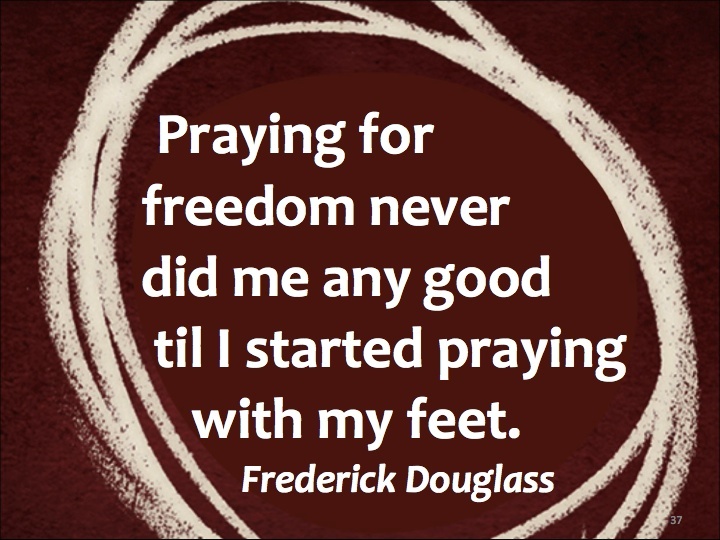 Sometimes our prayers have to have feet. We need to pray for the salvation of our loved ones, and talk to them about Christ. We need to pray for God to open the door for employment, and mail the resume. We need to pray for God’s help on a test, and study hard. We need to pray, and we need to march. I love the verb tense in this story! 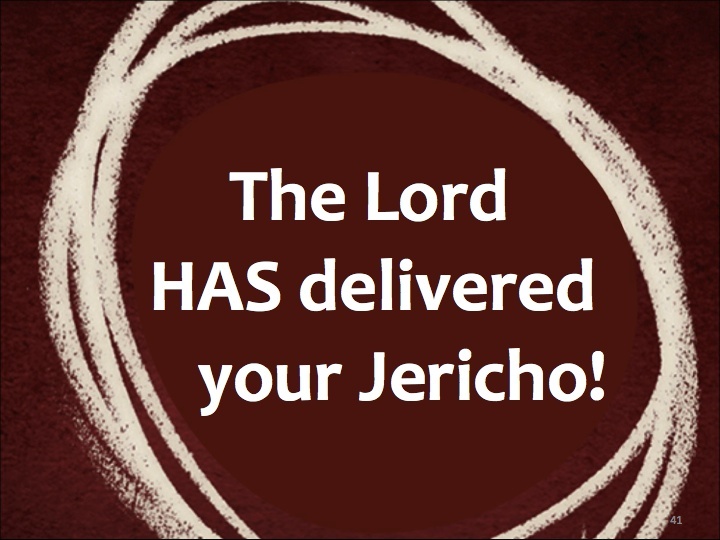 God told Joshua, “I have delivered Jericho into your hands” (Joshua 6:2). Later on, after the Israelites completed their 13th hike around Jericho, Joshua said, “Shout! For the Lord has given you the city” (v. 16). If you are praying for something that is in alignment with God’s Word, then God has given you your Jericho. But you may not see the walls come tumbling down until you march. Keep praying, keep marching, keep circling it in prayer, and watch those walls crumble! The book of Joshua is full of military campaigns, but there are two battles which are given significant “ink” – where we get an insight into the strategy, the battle itself, and the final outcome. They are the first two battles: Jericho and Ai. They both ultimately ended in total victory for the Israelites, but the path to victory was starkly different. I know that someone will say, “Hold on, Craig! It was Achan’s sin that caused the initial defeat at Ai.” And I wouldn’t disagree with you. But perhaps if Joshua had heard from the Lord before attacking Ai, God would have told him about Achan’s sin. NO OTHER CASUALTIES are mentioned in the entire book! Thirty-six people died because Joshua listened to other men instead of God. So… Who are you listening to?